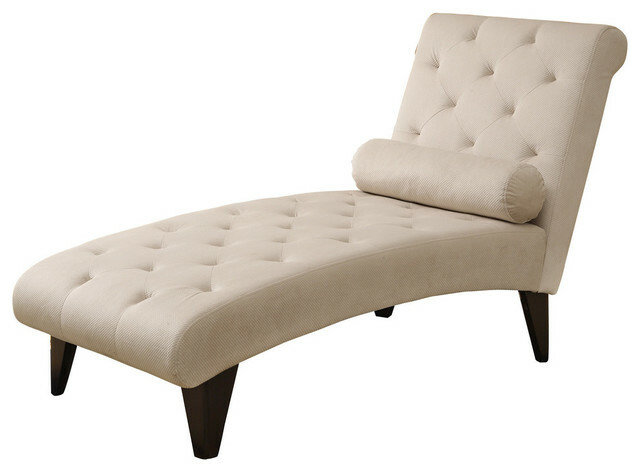 Stretch out in comfort on this gently contoured chaise lounger. Upholstered in a taupe microfiber, this chaise seating combines a tailored feeling and contemporary flair effortlessly. Tufted accents, and a cylindrical pillow add luxurious appeal to this chaise. Item features and details: Tufted detail, Accent pillow included, Adds a modern touch to any room. Color is Taupe microfiber upholstery with tapered wood legs. Material is Fabric, metal wood legs. W 28" / D 64" / H 36" / 44 lb. Sold by Houzz- Free Shipping!